Rasping “sr-r-r-r-r-ee.” Low in pitch, and with discernible individual notes. Description: Sexes similar. Light gray back, wings, and rump; cinnamon-gray underparts, head, and crest; white and yellow wing markings; bright red spot on wings; rusty-red undertail coverts; black chin and eyeline; and yellow terminal tail band. 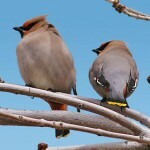 Larger and grayer than Cedar Waxwing. Immatures browner above, and with indistinctly streaked underparts. Habitat: Migrants found among fruit-bearing trees in woodlands, shelterbelts, and urban parks and gardens. 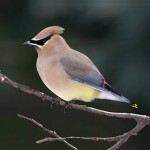 Often occur in flocks with Cedar Waxwings. Where in Nebraska: Occasional to rare winter visitor, irregular in geographic and yearly occurence. Field Notes: Irruptive in winter. Erratic southward movements in winter thought to be caused by food shortages in the north. 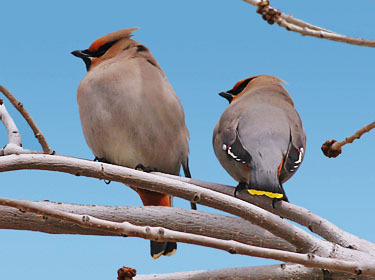 Fun Facts: Bohemian Waxwings have no true song and do not defend territories, perhaps because the fruits they eat are so abundant and available for such a short period of time.